Spanish lessons in Edinburgh for all levels. Spanish courses. SALT (Spanish Academy Language & Translation) is the first centre dedicated exclusively to the teaching of Spanish classes in Edinburgh. At SALT Edinburgh, you will be guided through your learning of the Spanish language by a skilled and well-practiced team of Spanish tutors. With experience in teaching at the University of Edinburgh and other educational organisations in the world, SALT’s team also have a wide range of additional knowledge in film and media, translation, interpretation as well as examinations which we incorporate into the services provided at SALT. This allows you to have a learning experience that you may not find at every Spanish language academy. Please feel free to browse our professional profiles to the left to find out more. Located at Castle Terrace in central Edinburgh, SALT aspires to fill an empty space in the cultural scene of the city; a point of reference to discover Spanish and Latin American culture, as well as a language which is spoken by over five hundred million people around the world. 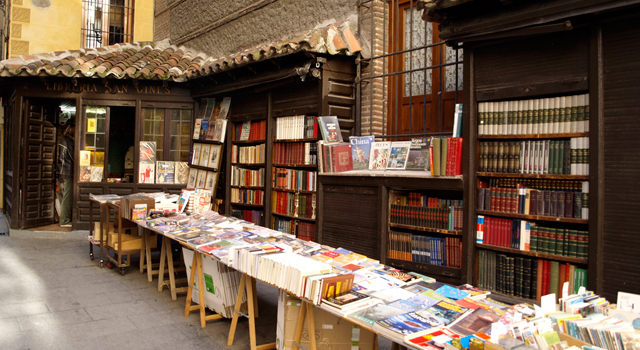 San Ginés bookshop in Madrid, Spain. Image courtesy of FDV.